I spotted The Tao of Travel on the library shelf because everything about this book was so NEW. It looked new, it smelled new, I've never seen or heard of it before and indeed - it was published only the previous year. 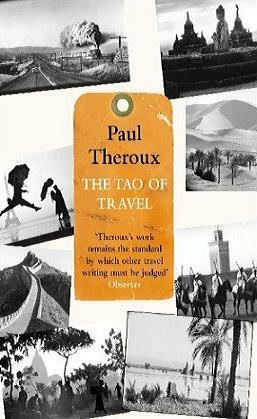 Described on the cover as a collection of the very best travel writing from Theroux's own and other writers' bibliographies, it looked like a huge treat. Guess what, I almost abandoned it after a few pages, and this is because of what I believe is the grandest structural disaster in putting a book together that I have ever seen: the first (longish) chapter consists purely of various short quotes. Let me be frank - I hate context-less quotations. A few words is rarely enough to paint any picture, to attach a reader to your vision, and I consider most such citations to be witticisms for witticism's sake. Yuck. And here I was, given a huge portion of this tasteless dish even before the dinner actually started. It is quite possible that if this awful, awful chapter was even one page longer, I would have given up on the book altogether. Having read it through I can say now - wouldn't that be a waste! After the disastrous beginning The Tao of Travel goes only uphill. It's a pleasant combination of Theroux's own essays, memories and musings, spiced generously with (decent sized, at last) quotations from other giants of travel writing and the resulting concoction is highly digestible. I am not a huge fan of Paul Theroux's writing style - it is slightly too poetic, too far removed from the tangible reality into fantasy worlds of his own creation for my liking, but I happily tip the hat to him anyway. I may not be much of a traveller (money...) and I certainly refuse to treat free-floating, rough riding exploration as the ultimate happiness but - how should I put it - I can honestly empathise with someone, who thinks otherwise. Through Theroux's lens, I can see why travelling may be an experience rewarding enough to be worth leaving home and risking your skin for. I can see it quite clearly. I'm still not going to pack my suitcase and take off, and I'm quite serene in this choice, but The Tao of Travel took me not on one, but many imaginary voyages during our short acquaintance and for that I am grateful. I even forgive Theroux the terrible first chapter.